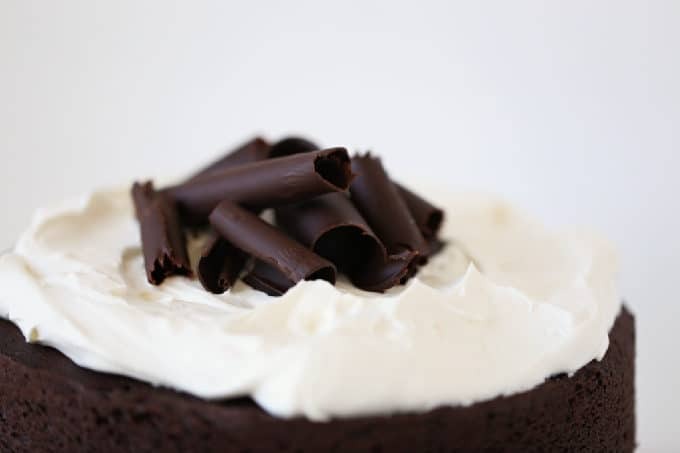 This is the perfect anytime cake, it’s delicious chocolate flavor topped with a stabilized whipped cream can be topped with chocolate curls, berries or sprinkles to serve up at a party, after dinner treat, and all the little celebrations in between the big celebrations. I find it hard to resist. My fork just keeps going back for more. 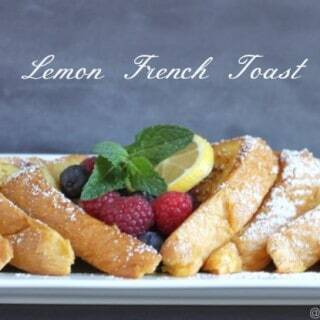 I like simple flavors and really love when making it is uncomplicated. This cake is easy, no mixer needed. Feel free to whip the cream by hand if you wish. 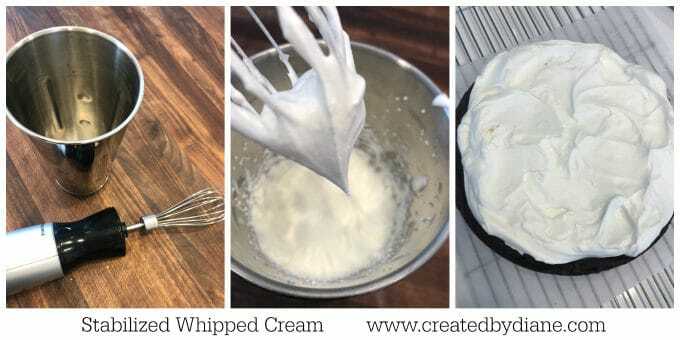 I have whipped cream by hand many times, but most often use an electric whip (a whip attachment on an immersion blender) it’s a small batch so it doesn’t take long either way. 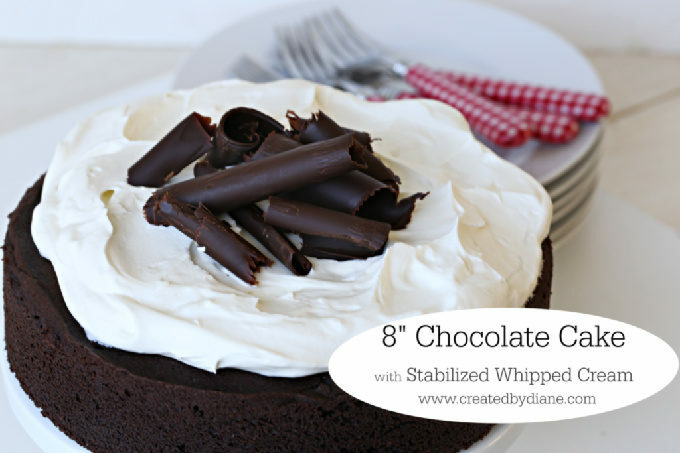 The whipped cream is stabilized, meaning it won’t get all watery as it sits on the cake. 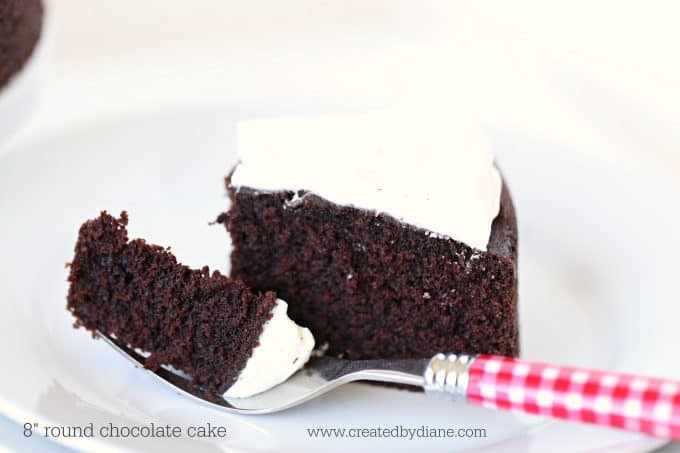 This cake is so great, it’s baked in an 8″ round pan, and comes out beautifully, I do wrap the outer edge of the pan with a baking strip to be sure the cake will bake up evenly. BE SURE TO CHECK OUT THE VIDEO below also! Chocolate Spaghetti, so creamy and delicious! 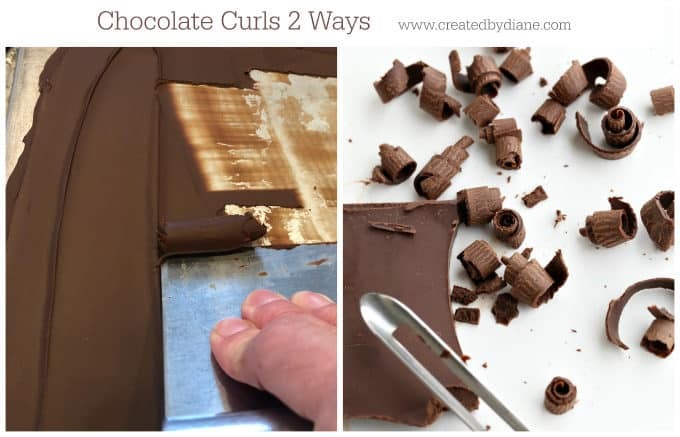 alternatively, you can use a vegetable peeler and glide it along the long edge of a candy bar for small curls, other options are chocolate chips and some cherries, berries (think strawberries, raspberries or blueberries) super easy toppings are items like chopped nuts or sprinkles. 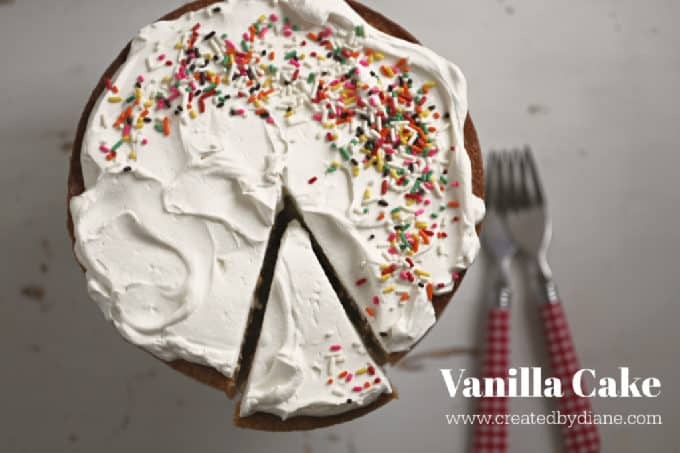 Normally whipped cream “weeps” and gets wet and separates easily, this simple tip will stabilize the whipped cream and stays nicely on the cake and lasts for days in the fridge on the cake. Add dry milk to the whipped cream, you can whip it by hand or with an electric whip, or beaters. I use THIS, it’s a handheld immersion blender with a whip attachment. I can’t tell you how many times a week I use this, I love it! I use it for smoothies, whipped cream, and sauces. If you want to see some sauce recipes look here. From start to finish this cake is ready in under an hour. And you’ll be ready to dig your fork into it and enjoy! 2 tablespoons dry milk- this stabilizes the whipped cream so it doesn't separate and it tastes great too. In a medium bowl add butter and sugar and whisk until well blended. Add in vanilla and egg and whisk to combine. then add in coffee and whisk until smooth. Bake at 350° for 33-35 minutes or until a toothpick comes out clean. Remove cake from oven and allow to cool for 10 minutes then place wax paper over the top of the cake to turn cake onto a cooling rack. Cool cake completely before applying any frosting. Whip heavy whipping cream with dry milk, powdered sugar, and vanilla until peaks form. 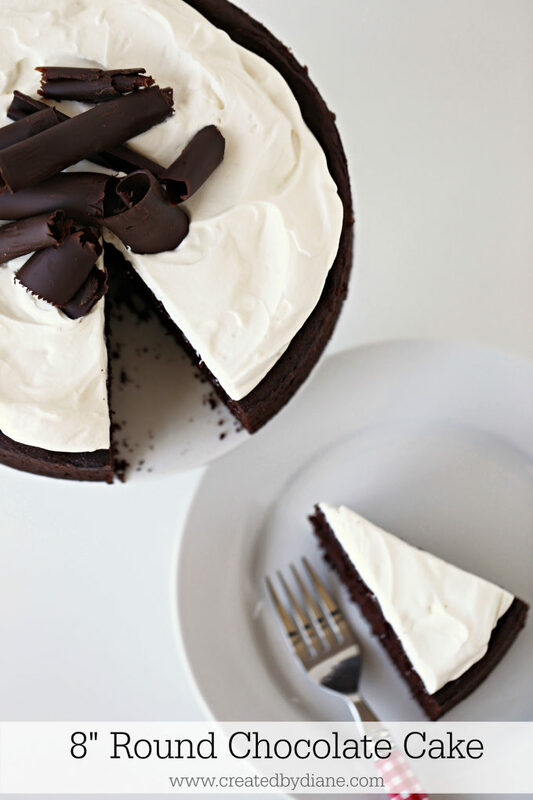 Spread whipped cream over cake and top with chocolate curls, sprinkles or chocolate chips for an easy decorated cake. heat chocolate chips with coconut oil spread on the back of an ice cold baking sheet (that has been in the freezer for a few minutes) then press a metal spatula or bench scraper to create the curls. Place curls on top of whipped cream and serve. After frosting cake with whipped cream and topped with the chocolate place in the fridge if not serving soon. 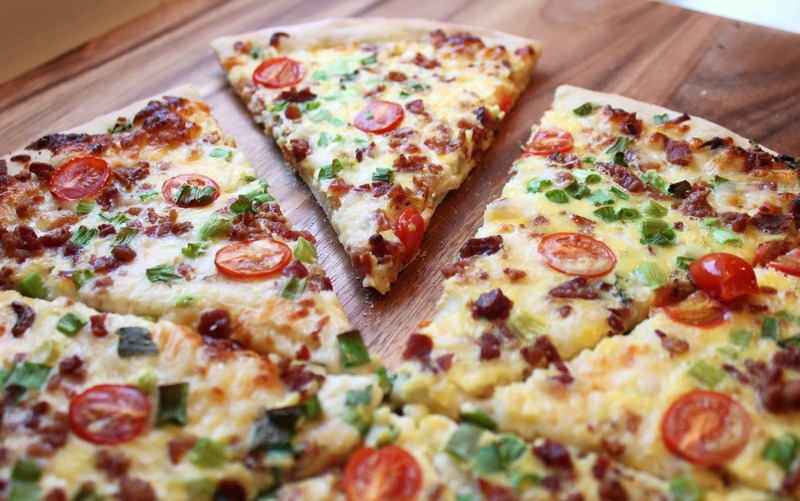 Can be made ahead and refrigerated, then taken out of the fridge at least 29 minutes before serving so it can begin to come to room temperature. 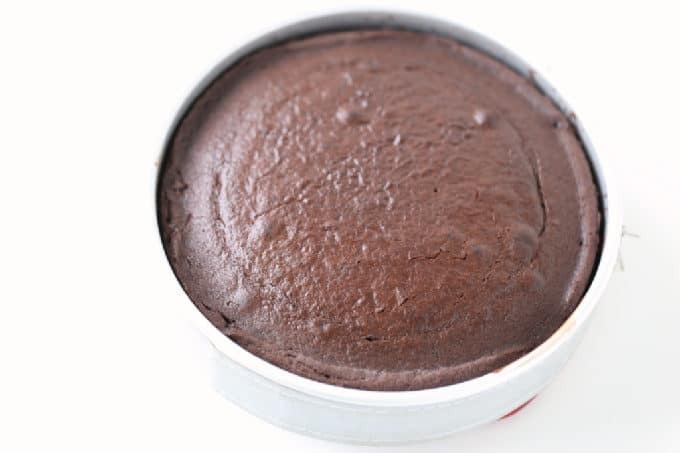 A cake that is served immediately or within a few hours even if refrigerated will be soft and fluffier than a cake that has been refrigerated overnight as the cake will become denser. So depending on how you like your cake you'll know when to frost your cake and serve it to your liking. I think the salt measurement is an error. Could you clarify the correct measurement. It looks fabulous. I’m anxious to try it. I adjusted it to reflect the correct amount of 1/2 teaspoon (not 1/24 teaspoon, that would be crazy to figure out, I must have hit the 4 by mistake) thank you for letting me know there was a mistake. I am in the middle of making this cake, but I am missing the step to add the flour. I am assuming it’s with the rest of the dry ingredients? 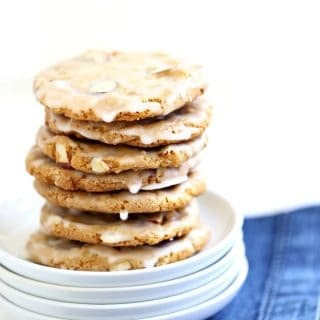 sorry, there was an error in the recipe box, I added the flour, yes it goes in with the other dry ingredients. After the cocoa and buttermilk.